To support Presidential and Congressional Initiatives to improve the participation of underserved Asian American and Pacific Islanders (AAPIs) in federal programs and to double the number of people served by community health centers by 2006, AAPCHO’s Medically Underserved AAPI Communities (MUAC) project has identified medically underserved AAPI communities across the nation. This Geographic Information Systems (GIS) project provides a county-level assessment of where AAPIs lack access to health care, and helps government agencies and public health workers effectively address AAPI needs. Overall, this project will help health centers in their efforts to improve the health of underserved AAPIs by giving them a better understanding of this population’s health needs. 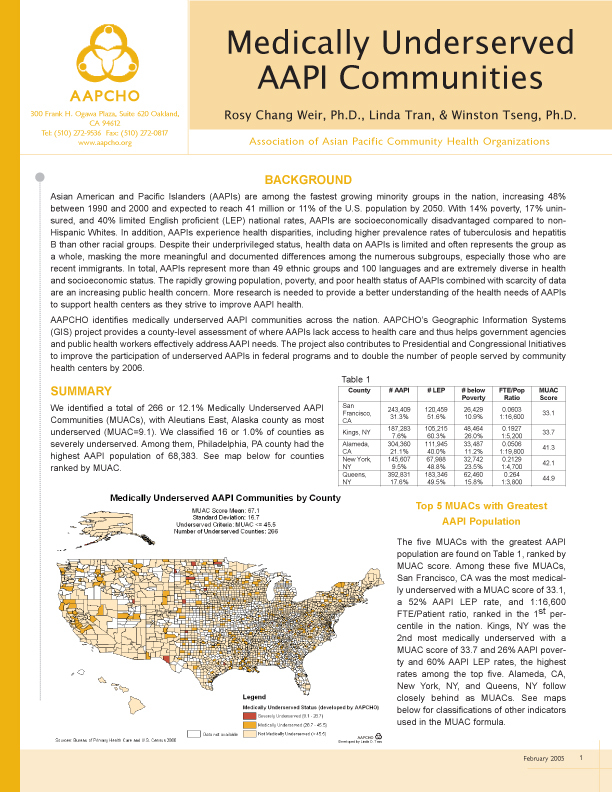 This fact sheet highlights medically underserved counties with the greatest number of AAPIs, exhibits the highest AAPI poverty and limited-English proficiency (LEP) rates across the nation, and summarizes data and methods used for AAPCHO’s MUAC project.